Of all the cocktails in the world, vodka martinis are among the most popular. Part of that is due to vodka's clear, clean flavor profile which allows whatever you mix it with to take over the drink's flavor. From cranberry to citrus and pomegranate to apple, there are many fun and fruity vodka martini recipes to explore. These sweet little cocktails are very easy to mix up. They're ideal for a casual afternoon as well as a fancy dinner party, or anything in between. The woo woo is not only a cocktail with a great name, it is also filled with delicious fruitiness. It is a great martini for any occasion, featuring a combination of peach schnapps and cranberry juice. It's sweet and beautiful and sure to be a hit at your next party. 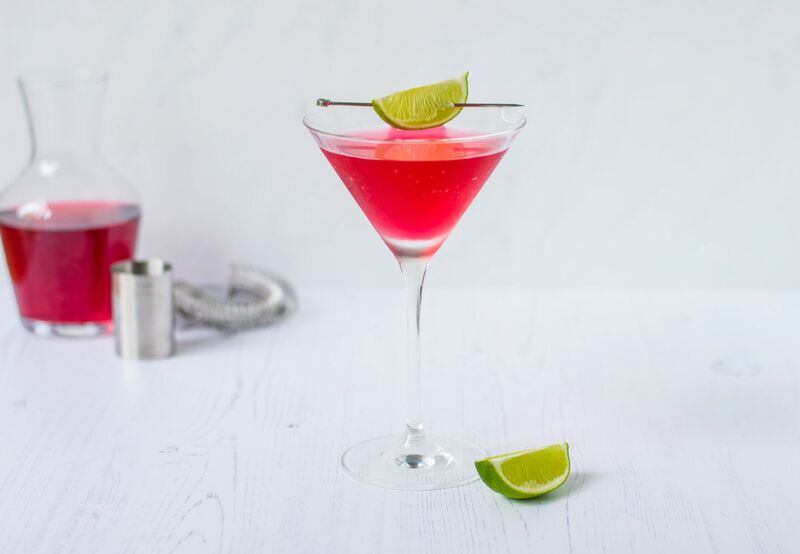 A fresh take on the popular cosmopolitan, you will need a specific vodka to mix up the delightful very berry cosmo. The base is Van Gogh's unique Açai-Blueberry Vodka, which is paired with the black raspberries found in Chambord. Mix in a little triple sec and cranberry juice and enjoy this sweet purple martini. Despite the name, this cocktail can work any time of year. The peach pomegranate holiday martini mixes one of those fabulous pomegranate vodkas with peach schnapps and orange and lemon juices for a fruit-filled wonder. The cinnamon-sugar rim is optional and one that you can skip in the warmer months of the year. When you think of a blueberry martini, you probably don't expect mango to be on the list of ingredients. It's a wonderful surprise and you'll be delighted at the layer of contrasting fruits that create a rare flavor experience. For this recipe, you'll need an orange liqueur and blueberry and mango juices, along with your favorite vodka. A truly unique vodka martini, the lotus blossom is a fantastic adventure in flavors that begins with a tempting pear vodka. The sake and lychee fruit give it an Asian feel, making it the perfect pairing for a stir fry or sushi dinner party. A simple and fun twist on the favorite lemon drop martini, this cocktail adds just a hint of lavender to the mix. It's a small addition that makes a remarkable difference. The lavender lemon drop is perfect for garden parties and you will need lemon vodka and juice, lavender, and simple syrup. Few cocktails are as simple and easy as the Hollywood martini. Similar to the gin-based French martini, it is a three-ingredient mix that uses items essential to a well-stocked bar. Once you get a taste for the combination of black raspberry liqueur and pineapple juice, you'll find yourself mixing this one up over and over again. Many times it is a single ingredient that takes a cocktail from good to great. In the case of this apple cider martini, that spark comes from velvet falernum. The sweet, spicy, citrus liqueur is essential for tiki cocktails like the rum runner. In this martini, it adds a punch of flavor to the vodka, apple cider, and ginger liqueur mix. This lovely cocktail is sure to tempt your taste buds. The melon cucumbertini is not only another simple three-ingredient recipe but also a great excuse to pick up a melon-flavored vodka. Refreshing only begins to describe this one and it really is best with cucumbers fresh out of the garden. It's hard to resist blue cocktails and vodka martinis are an easy place to find them. The deep blue sea martini is a fun recipe that combines your favorite vodka with sour mix, blue curaçao, and pineapple juice. You'll enjoy the tropical flavor all summer and the color alone will impress anyone. Sure, you get a good dose of coconut in this coconut martini recipe, but it has much more to offer. In this multi-dimensional cocktail, coconut rum and cream of coconut are accented with a vanilla vodka and a splash of pineapple. Think of it as an upside-down piña colada that's luscious and creamy. Vodka and gin do not have to be exclusive in martinis and they're excellent when poured into the same drink. The Dafne martini shows off the duo in a beautiful blue cocktail. The recipe combines gin, pear vodka, blue curaçao, and dry vermouth to create a fruity cocktail that is a little sweet and a little dry. Fresh kiwi is the star of the show when you want to make a fantastically fun kiwi martini. The fruit is muddled with simple syrup then shaken with the vodka of your choice. Go with a top-shelf clear vodka or play with flavors like citrus or kiwi to give it your own spin. When Pama Liqueur was first released in the 2000s, it made pomegranate-flavored martinis super easy to make. The Pama martini is a perfect example and this is a recipe you'll fall back on time and again. All you need is that liqueur along with an orange liqueur and vodka. When you want a dry vodka martini with just a hint of fruit, the April rain is an ideal choice. The recipe simply adds fresh lime juice to the vodka and dry vermouth mix, making it just a little more refreshing and interesting. The banana split martini proves that it's okay to play with your cocktails. This fun drink shakes vodka with banana and chocolate liqueurs to create a wonderful dessert cocktail. Yet, just like a real banana split, you can add other "topping" flavors to suit your mood and taste. Bring out your inner child while enjoying an adult libation! The gummy bear martini is a real treat that piles on the sweet fruit flavors. You'll use a raspberry vodka, peach schnapps, and cranberry juice to create it, but don't forget a skewer filled with those little gummy bears! They're half the fun. While the Halloween hpnotist is ideal for that holiday, it's a fabulously easy drink you can enjoy year-round. Three ingredients make up this enlightening drink: vodka, lemon juice, and Hpnotiq. The blue liqueur is made with tropical fruit juices and, when you garnish it with a glow stick, the drink illuminates beautifully. Looking for a great recipe to use that mango vodka in? You'll definitely want to get a taste of the sage lady. This brilliant little drink is packed with flavor, including fresh sage and cucumber. Add Cointreau for a hint of citrus, simple syrup for sweetness, and peach bitters for a finishing touch and enjoy! Passion fruit is another fun vodka flavor and it's fantastic when paired with rum in the passion pearl cocktail. The only other ingredients you need are triple sec and lemon juice, leaving you with a tasty vodka and rum sour that's a pleasure to sip.